What Are the Best Online Master's in Data Science Programs? What Else Can I Expect From an Online Master's in Data Science Program? As the amount of data in the world continues to increase, so will the need for those who can organize and make sense of it. Bureau of Labor Statistics (BLS) projections show that the demand for data-related occupations such as statisticians, financial analysts, and management analysts will grow by 33%, 11%, and 14% respectively by the year 2026. Many industries rely on data scientists to manage, process, and analyze data in order to create useful narratives, predict trends, solve problems, and drive decision-making. As a result, an online master's degree in data science is more valuable than ever. In a master's in data analytics online program, you learn how to use data and new data analysis technologies to draw inferences and make useful suggestions based on concrete trends. In addition to foundational skills like math, science, and computation, online data science master's programs also explore how to effectively communicate your data findings to others. Based in Indiana, the University of Notre Dame is a private institution that educates graduate students through seven schools and colleges. The university's college of science offers an online MS in data science. Data science students take 30 credits through 14 courses. One interesting course — storytelling and communications for data scientists — teaches learners to clearly convey complex technical concepts. Students also learn to build informative and well-designed presentations. A class on databases and data security covers techniques for managing, organizing, and protecting information stored in a database. Faculty build experiential learning components into the program to teach students practical skills. Through one case-based course on the data science industry, learners work in teams to solve practical data science problems. Additionally, learners can participate in two optional immersion weekends in Silicon Valley, where they learn from professionals in the field. Students can earn an online data science master's in 21 months while studying part time. Learners complete the degree through a combination of asynchronous and synchronous online coursework. They participate in live online sessions during the evenings and complete other online work independently. Students can finish the entire curriculum online, although they must visit campus for a three-day orientation at the start of the program. Applicants need to submit letters of recommendation, a statement of purpose, and GMAT or GRE scores. Based on their undergraduate degrees or professional experience, students must also demonstrate prerequisite knowledge in calculus, programming, and communication. Founded in 1867, the University of Illinois at Urbana-Champaign is a public research university and the flagship institution of the University of Illinois System. Through its 16 colleges, the school delivers over 250 undergraduate and graduate programs. UI's graduate students can select from 37 online degrees, including a master of computer science in data science. This online master's degree in data science requires 32 total credits, which students complete by taking eight four-credit courses. Students must take at least one course in each of four foundational areas: machine learning, data mining, data visualization, and cloud computing. They also choose three advanced courses from a list that includes theory and practice of data cleaning, foundations of data curation, and advanced Bayesian modeling. Students finish the program with one elective. UI partners with Coursera — a provider of massive open online courses — to deliver its online computer science curriculum. Students watch video lectures through Coursera while completing additional assignments, projects, and exams. Learners complete the program in a self-paced format, receiving regular feedback and advising from their professors. Students can earn a master's in computer science in as little as one year, although they can take up to five years to graduate. The university requires all graduate school applicants to hold a minimum 3.0 GPA over their last two years of undergraduate coursework, although students admitted to the master of computer science program typically hold a 3.2 GPA or higher. Admitted students may transfer in up to 12 credits of previous graduate-level coursework. Founded in 1693, William & Mary is the second-oldest higher education institution in the United States. The university offers over 80 undergraduate and graduate programs, including one of the best online master's programs in data science. The school's MS in business analytics program revolves around four pillars: business acumen, math modeling, computing technologies, and communicating with impact. Business courses teach students about marketing, finance, and economics. During math modeling classes, learners study data analysis, probability, inferential statistics, and related areas. In computing technologies coursework, students explore useful tools for data mining and business intelligence. Finally, the communications component of the curriculum prepares students to interpret and convey the results of data analysis. Business analytics students take eight courses for a total of 32 credits. Through a capstone course, learners define a complex business problem and develop a systematic solution using the skills they developed throughout the program. Before starting the program, students take two noncredit classes. They participate in an orientation that introduces them to the curriculum, academic policies, and online learning platform. Students also complete a boot camp that builds essential skills in Microsoft Excel. Applicants need a regionally accredited bachelor's degree and at least two years of business experience to qualify. Students without professional experience must prove business acumen in another way. The program accepted its first cohort in 2018; the average student in this group demonstrated an average GPA of 3.3 and about five years of work experience. The University of Maryland, College Park is a public research institution that serves as the flagship campus of the UMD system. The university boasts 12 colleges and schools along with more than 200 degree-granting programs. Through its joint program in survey methodology, UMD prepares students to become survey researchers, survey statisticians, and survey methodologists. The program offers a doctorate, an MS in survey methodology, and an online master's in professional studies (MPS). The school's online MPS in survey and data science teaches students about data analysis, surveys, data management, and data science applications. Learners also explore technical communication and study different methods to convey their findings. The curriculum encompasses 19 credits from core courses and 11 credits from electives. For core coursework, students take classes across five main topic areas: data output/access, data analysis, data curation/storage, data generating process, and research. Students complete the MPS curriculum through a combination of synchronous and asynchronous coursework. Each week they watch recorded lectures and log on at a predetermined time to discuss material with their classmates and instructors. UMD generally delivers online classes in 12-week terms. However, many classes in the MPS curriculum are worth one or two credits and run 4-8 weeks. Applicants need at least one year of work experience related to statistical analysis, survey design, or data collection. They must also demonstrate prior experience or coursework in applied statistical methods. Students who cannot prove adequate knowledge in statistics must pass an entrance exam. A private institution, Boston University enrolls over 34,000 students through more than 300 academic programs. Through BU's online MS in applied business analytics program, students learn to analyze large datasets and make data-informed decisions related to marketing, finance, and business operations. Graduates know how to select appropriate analytical methods, monitor performance, and propose solutions to business issues. Business analytics students complete 10 required courses for a total of 40 credits. They take four core courses that discuss business analytics, operations management, financial concepts, and decision-making. Through the operations management course, students learn about how business processes affect an organization's overall performance and success. They also explore methods for analyzing and improving processes in the manufacturing and service sectors. In the decision-making class, learners examine both quantitative and qualitative strategies as well as topics like cost-benefit analysis, decision trees, and risk assessment. Learners also take four specialization courses in business analytics. A course on web analytics discusses text mining, web mining, and tools like Google analytics. Other specialization classes cover topics like data mining, marketing analytics, and enterprise risk analytics. Learners complete the remaining eight credits through two electives; options include classes in cybercrime, terrorism, and agile software development. Students can complete the program entirely online in 18-24 months. Online learners gain access to many student resources. BU's information services and technology office provides technical support, while its office of distance education introduces students to the online learning platform and helps them order textbooks. Additionally, online learners can access tutoring through Smarthinking. Based in Washington, D.C., American University is a private research university that was founded in 1893. The school educates more than 12,000 students and offers over 150 bachelor's, master's, and doctoral degrees. The university oversees 27 online graduate programs, including several through its business school, which holds accreditation from the Association to Advance Collegiate Schools of Business. Business students can pursue an online MS in analytics that prepares them for data science professions. Through the program, students learn how to use data to approach fiscal and operations problems in business. The program also goes beyond data science and teaches students to apply analytics, statistics, and big data knowledge to practical organizational issues. The program encompasses 33 total credits and includes six core courses. Through core coursework, students explore the basics of business and data science, as well as how these two fields intersect. Participants study areas like predictive analysis, business intelligence, and managerial statistics. Learners also take four electives in a concentration area. The program features four specializations: business foundations, cybersecurity, financial analytics, and consulting. Alternatively, students can create their own focus area by choosing electives in a particular field. Online MS in analytics students complete a blend of synchronous and asynchronous coursework. They attend synchronous webcam sessions and complete weekly, self-paced assignments. Aside from typical classes, the curriculum includes two on-campus practica. During these in-person sessions, students solve business problems with real organizations and attend lectures given by business leaders. Based in Dallas, Texas, Southern Methodist University is a private research institution that was established in 1911. The university educates 12,000 students through more than 100 undergraduate and graduate options. SMU's online MS in data science boasts an interdisciplinary curriculum that includes courses from the college of humanities and sciences, the school of engineering, and the school of the arts. Over the course of the program, students build their computer science, data visualization, communication, and strategic decision-making skills. The curriculum consists of 33.5 credits of coursework. One interesting course on machine learning explores regression, supervised classification, and the data preparation workflow. During this class, students design data mining processes using Python and R. Another fairly unique class — natural language processing — covers data mining, text mining, and machine learning as these topics relate to unstructured big data. Students use WordNet to generate solutions from actual datasets. Learners can focus their studies through two concentrations. Students can specialize in machine learning to better understand self-optimizing systems. Alternatively, students who concentrate in business analytics learn to interpret data and recommend business solutions. Faculty deliver the curriculum through weekly, synchronous sessions. Students can complete the program in 20-28 months and have the option to begin their studies at one of four start dates per year. Applicants need a bachelor's degree from a regionally accredited institution. They also need to take the GRE, unless they hold at least five years of industry experience or a previous master's degree. Additionally, students must demonstrate skills in mathematics and programming. Founded in 1865, Worcester Polytechnic Institute is a private university based in Massachusetts. Through 14 departments, the school offers over 50 undergraduate and graduate degree options, including an online master's in data science. By the end of WPI's data science program, graduates become proficient in database management, statistics, data analysis software, and analysis techniques. They also develop the management, leadership, and interpersonal skills needed to lead a team or run a department. The MS in data science curriculum consists of 33 credits. Learners take 15 credits through core courses in five key areas, including integrative data science, data analytics and mining, data access and management, business intelligence and case studies, and mathematical analytics. Students also take 15 elective credits. One interesting option — managing technical innovation — explores how companies introduce new products and processes. Another elective teaches learners about the best visualization strategies for various types of data. Toward the end of the program, students carry out a major project as part of a team. They integrate the skills and theories learned throughout the program, write a paper, and give a presentation to faculty members and corporate sponsors. Applicants need a bachelor's degree along with a strong background in programming, data structures, algorithms, calculus, statistics, and linear algebra. WPI accepts students without a related bachelor's degree, provided they take prerequisite courses before enrolling or during their first semester. Prospective learners must also submit three letters of recommendation and a statement of purpose. Founded in 1831, Syracuse University is a private research university based in central New York. The school boasts over 200 undergraduate majors and more than 200 graduate options. Syracuse's online options include one of the best online data science master's programs. Syracuse's applied data science master's program boasts an interdisciplinary curriculum that draws from both its school of information studies and its school of management, emphasizing the business applications of data science. The program equips students with skills in data management and data analysis while also teaching them to make data-driven decisions. The curriculum consists of 36 credits distributed across a common core, analytics application core, electives, and a capstone requirement. The common core includes six courses that deal with topics including big data, business analytics, and database administration. Through analytics application core classes, students build on the foundational knowledge they developed in common core courses. Students also take one or two courses that deal with topics like accounting analytics, marketing analytics, fiscal analytics, and principles of management science. Learners can tailor their curriculum to suit their interests through 12-15 credits of electives. An interesting course explores some of the data warehousing strategies that help businesses make better decisions. At the end of the program, students compile a portfolio of projects that display their data science abilities. Syracuse delivers its online applied data science degree through a mix of asynchronous coursework and synchronous classes. Distance learners can start their course of study at one of four dates throughout the year and graduate in as few as 18 months. Colorado State University-Global Campus is an online-focused, state university founded in 2007. Today, the university educates 18,000 students through dozens of undergraduate and graduate programs, including an MS in data analytics. CSU's data analytics curriculum prepares students for careers in data science, business intelligence, and data analysis. Through the program, students learn to use industry tools like SAS, SQL, and Tableau. They also explore topics that include data mining, predictive analytics, and enterprise performance management. Students complete a capstone in business intelligence and data analytics to finish the program. Through the capstone, learners integrate what they have learned to develop a project in a specific area of data analytics. Participants can customize their curriculum by choosing one of 24 specializations. Some of the best options for data science students include cybersecurity, information technology, and applied business management. CSU-Global provides many resources to its distance learners, including 24/7 technical support and academic tutoring. The school also offers writing help through Smarthinking. Learners can access online library databases, publications, and articles remotely. Plus, CSU-Global offers 24/7 librarian chat services. Applicants need a minimum 3.0 GPA and a bachelor's degree in management information systems, information technology, computer science, or data management. Additionally, prospective students must submit a resume and a statement of purpose outlining their academic and career goals. One of the cheapest online data science master's degrees, CSU's program charges in-state and out-of-state students the same tuition rate. The New Jersey Institute of Technology is a public research university based in Newark. The school hosts more than 125 undergraduate and graduate programs through six schools. NJIT also offers 35 web-based graduate programs, including an MS in computer science with a concentration in database and data mining. This computer science degree requires learners to complete 30 credits by taking 10 courses. All students take four core classes that deal with topics including algorithms, operating system design, and data management system design. One core class — internet and higher-layer protocols — introduces the protocols and standards underlying the internet. Learners also complete nine credits through three specialization courses. Data science students take data mining, cloud computing, and advanced database system design. Alternatively, computer science students can focus in cybersecurity or networking. Students round out their degrees by taking nine elective credits. Full-time learners can finish the program in three semesters, while part-time students usually take around five terms to graduate. NJIT delivers most online coursework in an asynchronous format, though some classes require synchronous participation. Applicants need an undergraduate degree in a related field, earned with a minimum 2.8 GPA. The school's department of computer science offers a bridge program that allows students without a computing background to study computer science at the graduate level. The bridge program includes four semester-long courses that cover programming, operating systems, data structures, and computer science. NJIT recommends that students also submit their GRE scores. Established in 1870, Ohio State University is a public institution based in the city of Columbus. The school operates 18 colleges and schools along with over 200 centers and institutes. In terms of academic offerings, Ohio State boasts several graduate options, including an online master's degree in business analytics. The specialized master's in business analytics program teaches students about data analytics and its applications to business innovation and productivity. Learners explore data management and become fluent in descriptive, predictive, and prescriptive data analysis methods. The business analytics curriculum consists of 31.5 credits from 11 courses. Classes cover areas like statistics, managerial economics, and leadership. At the end of the program, during their final summer term, students apply and hone their skills through a required capstone project. During the capstone, learners work on an analytics project using data from their current employer or a sponsoring company. Ohio State delivers its master's in business analytics through a hybrid format, where students complete 75% of their coursework online and 25% on campus. Every other Saturday, participants attend 8.5-hour, in-person sessions that involve discussions, demonstrations, and hands-on group projects. Learners progress through the curriculum in seven-week sessions, graduating in 2.5 semesters. Applicants need to submit GMAT or GRE scores, a resume, and letters of recommendation. Ohio State waives the standardized test requirement for students with a minimum 3.2 undergraduate GPA and four years of work experience; students must have also completed two college-level math courses with a "B" or higher. Located in Davie, Florida in the Miami metropolitan area, Nova Southeastern University originally opened in the 1960s with a focus on physical and social sciences. Since then, the school expanded its scope and now offers programs across numerous disciplines, including several distance learning degrees such as an online data science master's. The data science program at NSU takes the form of a master of business administration with a concentration in business intelligence and analytics. The program's curriculum consists of 40-49 credits, including 22-31 MBA core courses and 18 credits in business intelligence and analytics. Notable data science courses include data management, advanced data analytics for business management, data mining and predictive analytics fundamentals, and business intelligence and data warehousing. Full-time students can earn their degrees within 21 months. Catering primarily to working professionals, the program delivers all coursework asynchronously and eliminates all on-campus and in-person requirements. Students may apply for admission for five different start dates throughout the year: August, October, January, March, and May. Students in the program can compete for a scholarship awarded in conjunction with Kemet Electronics worth up to $12,500 each year. As a private university, NSU charges all online students the same base tuition rate. Applicants must submit evidence of either a minimum cumulative undergraduate GPA of 2.5 or a minimum 2.5 GPA during their final 60 undergraduate credits. Students with a 2.25 GPA can still earn admission with a strong GMAT or GRE score. Based in the college town of Bloomington, Indiana University Bloomington likely earns the most nationwide renown for its storied Hoosiers basketball teams. The university also offers strong programs across several disciplines, including various online programs. IU Bloomington now offers one of the best online data science master's programs in the nation. The program's curriculum consists of 30 credits in total and typically allows students to graduate in 18-24 months of full-time study. All students choose from one of four concentrations: cybersecurity, precision health, intelligent systems engineering, or data analytics and visualization. All students also complete a hands-on capstone project demonstrating all of the data science skills that they learn throughout the program. Aiming for flexibility for working professionals, IU Bloomington delivers all coursework in the program asynchronously and never requires students to visit campus or complete any in-person assignments. All prospective students must submit evidence of a minimum undergraduate 3.0 GPA to apply. The program's admissions committee prefers previous knowledge of calculus, probability, statistics, and linear algebra. Programming knowledge also provides a boost to applications. Prospective students who do not meet these initial prerequisites can enroll in IU Bloomington's data science essentials course to get up to speed. One of ten members of the University of California System, UC Riverside primarily caters to the student population in the surrounding Inland Empire. Nevertheless, UC Riverside expanded into the distance learning space in recent years, allowing the university to offer some of its stronger programs to students around the nation and around the world. As such, students can now complete an online master's degree in data science at UC Riverside without ever needing to visit Southern California. The data science program at UC Riverside awards a master of engineering degree with a data science specialization. The curriculum consists of 53 credits in total, including 16 credits of core coursework and 16 credits of data science-specific coursework. Core courses include principles of engineering management and introduction to systems engineering, while specialization courses include data visualization and big data tools, statistical data mining, and machine learning. Students also complete a project design course as a capstone experience, which involves a comprehensive report and literature review. Aiming to meet the needs and schedules of working professionals, the program delivers all of its coursework asynchronously and does not include any on-campus requirements. The program lists GRE scores and undergraduate GPAs as factors in admissions decisions; however, the program does not list minimum thresholds for either. Additionally, students with two years of work experience and a bachelor's degree in a relevant field can get the GRE requirement waived. Located right on the border with Alabama on the Florida Panhandle in Pensacola, the University of West Florida operates a central campus on a 1,600-acre nature preserve. Nevertheless, students need never visit that campus to earn a degree from UWF, which offers several of its strongest programs through distance learning — including one of the nation's best online master's programs in data science. Taking the form of a master of science in information technology with a specialization in database management, UWF's online data science program requires students to complete a 30-credit curriculum before graduating. Those 30 credits include 12 credits of core courses and 18 credits of database management-specific courses. Core courses include management and organizational behavior, applied information security, and database systems, while specialization courses include data mining, database administration, and advanced database systems. All students complete a significant computer science project as a capstone experience. Catering primarily to professionals who work full time, the program delivers all coursework asynchronously and does not include any on-campus or in-person requirements. The program takes a holistic approach to admissions and does not list a minimum GPA threshold; however, all students must submit GRE (minimum 145 quantitative and 150 verbal) or MAT scores (minimum 370). Students may apply for admission for the fall, spring, or summer semesters. Based in Wilmington, UNCW originally opened with the primary goal of providing an education to veterans returning from World War II. As such, the school maintains a long history of providing education to working professionals. UNCW stays true to that focus to this day by offering several of its best programs through distance learning, including one of the cheapest online data science master's degrees in the country. The online data science program at UNCW awards a master of science degree in business analytics. To earn this degree, students must first work through a 30-credit curriculum, a process that students can complete within 12 months of full-time study. Those 30 credits include courses like descriptive, prescriptive, and predictive analysis; business analysis applications and case studies; data visualization; and programming for analytics. The program does not include a capstone experience or any in-person or on-campus requirements. Students can complete the program without ever attending a scheduled course, as UNCW delivers all of the required online coursework asynchronously. Each course lasts for seven weeks. To apply to the program, all applicants must submit evidence of a minimum cumulative undergraduate GPA of 3.0. The program does not require applicants to submit GRE or MAT scores. Students may apply for start dates in the fall and spring semesters. Originally opening as a teacher preparation school in the titular city of La Crosse in the early 1900s, UW-La Crosse now offers undergraduate and graduate programs across various disciplines. In the 21st century, the university expanded both its physical campus and its digital presence. As such, students can now earn an online data science master's at UW-La Crosse. UW-La Crosse's online master of science program in data science is the result of a collaboration with other UW schools, including Superior, Stevens Point, Green Bay, Oshkosh, and Eau Claire. Students may apply to any of those schools to complete the same program, although the school that they apply to serves as their administrative base. To earn admission, all applicants must submit evidence of a minimum 2.85 undergraduate GPA or 3.0 graduate GPA. The program does not require applicants to submit standardized test scores. The program's curriculum consists of 36 credits, including core courses such as statistical methods, data warehousing, big data, ethics of data science, and prescriptive analysis. Furthermore, all students in the program complete a capstone project that involves the use of real-world data. UW-La Crosse delivers all coursework in the program asynchronously and never requires students to visit campus to complete any requirements. The program's website highlights its overt focus on providing an education to working professionals. A private, Roman Catholic and Jesuit-affiliated university based out of Denver, Colorado, Regis University originally opened its doors in New Mexico in the late 1800s. Over the years, Regis went through several iterations, eventually moving to Colorado and expanding the programs it offered. That evolution included distance learning, as the school now offers several of its programs online, including an online data science master's degree. The master of science in data science program at Regis strives for flexibility above all else. The program delivers all of its coursework asynchronously and never requires students to complete any in-person or on-campus requirements. Furthermore, the program offers six different start dates to online students: January, March, May, June, August, and October. The program also does not require applicants to submit GRE or MAT scores, although all prospective students must submit evidence of a minimum 3.0 undergraduate GPA to earn consideration for admission. As a private university, Regis does not distinguish between Colorado residents and out-of-state online students when charging tuition. Students in the program must complete a 36-credit curriculum before graduating. The program's core curriculum includes courses like data analytics; ethics, privacy, and social justice in data science; statistical methods and experimental design; and data engineering. All students in the program also complete a two-part practicum experience in data science during their final semester. Based in the town of Henrietta within the eponymous Rochester, New York metropolitan area, Rochester Institute of Technology originally opened in the 1890s as the result of a merger between a literary society and technical school. As such, the school boasts strength across a variety of disciplines. The school also evolved with the times and now offers many of its programs online, including an online data science master's degree. The online master of science program in data science at RIT requires students to complete a 30-credit curriculum before graduating. Those 30 credits include core courses such as introduction to data science management, software engineering for data science, and regression analysis. As a prerequisite, all students must first complete the UCSanDiegoX Data Science MicroMaster's program, which consists of the equivalent of nine credits and focuses on basics like Python, statistics, machine learning, and big data analytics. RIT's program does not include a capstone or thesis requirement, delivers all coursework asynchronously, and never requires students to visit campus. The program offers multiple start dates throughout the year and accepts applications on a rolling basis, although students should apply at least six weeks before their intended start date. While the program does not require prospective students to submit GRE or MAT scores, applicants should submit evidence of a bachelor's degree with a minimum 3.0 GPA. Located in Potsdam, New York, Clarkson University receives its name from Thomas Clarkson, a local entrepreneur who died while saving a fellow worker from a loose pump in a local sandstone quarry in the late 1800s. Honoring his memory, Clarkson offers particularly strong programs in entrepreneurship. Nevertheless, the school also excels in various other fields and offers several of those strong programs through distance learning, including an online data science master's degree. Unlike many of its peers, the data analytics program at Clarkson delivers coursework through a mixture of synchronous and asynchronous learning. To graduate, students must complete the program's 36-credit curriculum, which includes 10 courses and a six-credit capstone experience. Notable courses include data mining; applied machine learning; data warehousing; information visualization; and database design, modeling, and implementation. The capstone course requires students to complete a relevant, sponsored project that involves working in a team with other students in the cohort. The experience aims to mirror working conditions in the industry. Though the program does not list a minimum GPA threshold, all students must submit GMAT or GRE scores to earn consideration for admission. As a private university, Clarkson charges all students in the program the same base tuition no matter where they live. A private, Jesuit-affiliated university based in Baltimore, Loyola University Maryland holds the distinction of one of the oldest Jesuit universities in the nation and the first to bear St. Ignatius of Loyola's name. Best known for its programs in business and education, the school began to offer several of its stronger programs through distance learning during the first decade of the 21st century. As such, Loyola now offers an online data science master's degree. The online data science program at Loyola strives for flexibility, providing three different course outlines to students: a two-year, a three-year, and a four-year sequence. The program's curriculum consists of either 10 or 11 courses, or approximately 30-33 credits. Notable core courses include business intelligence and data mining, statistical computing, machine learning, and programming for data science. All students in the program also complete a technical capstone project during their final semester. In addition to core coursework, students complete various foundational elective courses in business and computer science. Most courses in the program use a hybrid delivery method that includes both synchronous and asynchronous elements. Currently, the program only accepts students for the fall semester. The admissions committee reviews applications on a rolling basis. While the program does not list minimum thresholds for GPAs or GRE scores, all prospective students must submit evidence of prior coursework in calculus, statistics (in a business context), and computer science. Located in Stillwater, Oklahoma State University typically competes with the University of Oklahoma for the title of the Sooner State's flagship university. Originally opening as an agricultural and mechanical college in the 1890s, OSU evolved over the years to offer strong programs across a variety of disciplines. In modern times, the school offers several of its degrees through distance learning, including an online data science master's program. The online data science program at OSU came about as the result of a merger between the university's MS in MIS data science program with the MS in business analytics. Graduates of the program become fluent in several programming languages and programming tools, including R, Tableau, SQL, Python, and SAS. The online version of the program primarily caters to working professionals, delivering all of its coursework asynchronously and never requiring students to complete any in-person or on-campus requirements. All online students enroll part time while completing the 33-credit curriculum, which takes two years to finish and features courses like advanced business analytics and advanced marketing research analysis. Students can complete "career-focused elective tracks" in areas such as healthcare analytics, statistics, human resource analytics, and optimization. According to data gathered by the program, 90% of graduates found work within three months of graduating, and their average annual salaries totaled $81,500. The program does not list any minimum GPA requirements, but all prospective students must submit GRE or GMAT scores. The program accepts new students for the spring and fall semesters. Located in the titular city of Dearborn, the University of Michigan-Dearborn originally opened in the 1950s thanks to manpower supply studies conducted by Ford. In recent years, the school began to offer several of its programs through distance learning, including an online data science master's program. Students earning an online master of science in data science from UM Dearborn can choose to complete a concentration in applications, business analytics, computational intelligence, or big data informatics. The curriculum consists of 30 credits, and notable core courses include database systems, data mining, intelligent systems, and data security and privacy. All students must also complete either a master's/capstone project or an analytics experience capstone course. Aiming for flexibility for working professionals, the program delivers all of its online coursework asynchronously; however, the program also requires students to complete certain on-campus elements before graduating. All applicants to the program must submit evidence of a STEM-related bachelor's degree with a minimum 3.0 GPA. Prospective students must also complete certain prerequisite undergraduate coursework, including courses in programming, mathematics (calculus and linear algebra), and statistics. The program does not list any standardized test requirements. Based out of the college town of Columbia, the University of Missouri primarily earns nationwide renown for its journalism school, one of the first of its kind when it opened in the early 1900s. In recent years, the school began to pour its significant state school resources into expanding its national profile, which included the expansion of distance learning offerings. As a result, MU now offers an online data science master's program. The online data science and analytics program at MU requires students to complete 34 credits before graduating. Those 34 credits include core studies such as database and analytics, big data security, big data visualization, and data and information ethics. Students also complete a big data analysis case study and capstone experience. The program uses a blended learning method, meaning that online students must complete certain on-campus elements to graduate. Nevertheless, the program delivers all of its online classes asynchronously. The program accepts applicants for the fall semester. All prospective students must submit evidence of a minimum 3.0 GPA during their final 60 undergraduate credits. Applicants must also submit GRE scores. MU allows out-of-state online students to pay in-state tuition. Additionally, three out of every four students at MU receive some sort of financial aid. The school also provides an in-house tuition award to eligible online military students. Every online master's degree in data science program is unique and therefore offers different courses, timelines, and learning formats. However, there are certain characteristics, like foundational courses and basic timeframes, that you can expect from most online programs. Details may differ from school to school. Web Analytics for Business: In this course, students learn how to analyze and leverage website data for businesses. Students learn how to monitor, collect, analyze, and report data, such as website traffic, social media influence, and sales information, so that businesses can optimize their online presence and make informed marketing decisions. Data Visualization: In this course, students learn how to organize and interpret large quantities of data using charts and graphs. The ability to communicate these findings and make persuasive suggestions based on data is an essential skill when analyzing data for a business or organization. Students learn to use tools like Tableau to create narrative data storytelling. Big Data: With the rise of the internet and the amount of data available for analysis, data scientists must prepare to encounter big data -- quantities of data so large and diverse that normal statistical tools are not sufficient -- and the technologies used to process it. In this course, students learn how to manage and process large data sets for businesses and organizations. How Long Does It Take to Get an Online Master's in Data Science? Most online data science master's programs require around 30-32 credit hours of coursework. Students typically earn their degree in around three years. Depending on program format, number of transfer credits, and course load, students can earn their degree in one to five years. A few factors can affect how long it takes to earn your degree. Accelerated and asynchronous course formats allow you to advance through your degree more quickly than you would otherwise, since you may be able to finish a course in less time than an average quarter or semester. If your program uses the cohort format, in which you advance toward your degree at the same pace as your peers, or synchronous coursework, for which you must be online at the same time as your classmates, that may limit how quickly you can earn your degree. Before selecting a school, it's critical to check that the school is accredited. When a school is accredited, an agency has reviewed the school and determined that it meets certain standards of academic quality. Schools can be either regionally or nationally accredited. In general, regional accreditation is more popular than national accreditation and is considered more prestigious. While not all regionally accredited schools accept transfer credits from nationally accredited schools, all nationally accredited schools accept transfer credits from regionally accredited schools. 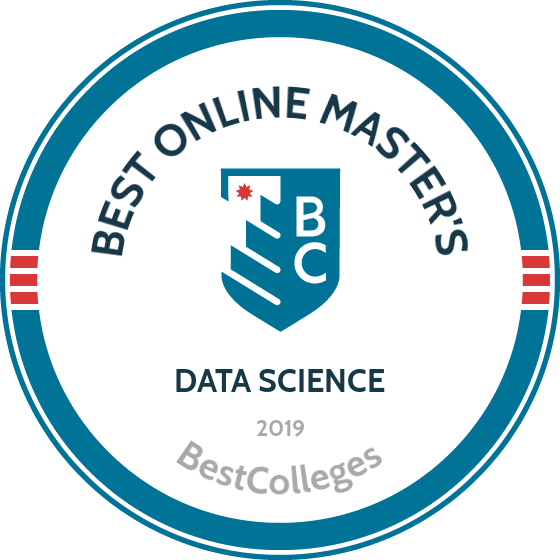 When choosing the best online data science master's degree for your needs, make sure to check whether the program is nationally or regionally accredited. Common regional accrediting agencies include the Higher Learning Commission, the Middle States Commission on Higher Education, and the New England Association of Schools and Colleges. Common national accreditation agencies include the Distance Education and Training Council and the Accrediting Commission of Career Schools and Colleges. Two main organizations oversee the accreditation of schools: the Department of Education (ED) and the Council for Higher Education Accreditation (CHEA). The ED is the U.S. government agency responsible for overseeing the quality and integrity of U.S. schools and education. CHEA is an association of thousands of colleges and universities that advocates for accrediting agencies as a way to self-monitor the quality of education in the U.S. Although the ED and CHEA do not accredit schools themselves, they do keep a list of accredited programs, thereby allowing the public to track which schools are accredited by a legitimate accrediting agency. You can find a full list of accredited institutions on the ED's website or CHEA's website. Although the highest concentration of computer and information systems manager jobs exists in the District of Columbia, Connecticut, and Massachusetts, those working in this occupation earn the highest wages in New York, California, and New Jersey. Virginia is among the top five states offering not only the highest annual salary but also the highest concentration of jobs for these managers. In general, these data science professionals can find higher annual salaries and a higher concentration of jobs in large cities. Those who graduate with an online master's in data science are qualified for a variety of careers. Since nearly all industries rely on data in some way, graduates can find work in many fields, including marketing, business, technology, education, engineering, security, retail, and healthcare. Data scientists go on to become statisticians, financial analysts, management analysts, IT directors, and database administrators. They most often work in office buildings but may sometimes travel to meet with their clients. Statisticians employ mathematical and statistical concepts to analyze data and provide solutions to problems. They work for a variety of industries that rely on data, including healthcare, businesses, education, marketing, and engineering. This profession usually requires a master's degree at minimum. Financial analysts provide financial guidance to individuals and businesses alike. They rely on their analysis of historical and contemporary data to inform investment recommendations. They also assess the performance of stocks and investments and use this data to come up with financial predictions..
Also known as management consultants, management analysts review a company's inner workings to determine how to make the company more profitable. Their goal is to help companies increase revenue, reduce costs, and become more efficient overall. In addition to working in offices, management analysts often travel to meet clients. Database administrators operate, manage, design, and merge databases, helping businesses and organizations keep their data secure, efficient, and organized. They often work on databases that store important information, such as financial data and shipping records, which allows data analysts to more effectively gather and use data. Computer and information systems managers, also known as IT managers, manage and develop an organization's computer systems. IT managers start by determining an organization's IT needs and then develop a plan to address, implement, and manage these needs through the incorporation of software, hardware, and trained personnel. The career comprises chief IT officers, chief technology officers, and IT directors, occupations that often require a graduate degree. Professional data science organizations bring together data scientists, students, and related professionals from all over the country and even across the globe. In addition to fostering community and encouraging networking, professional organizations offer many member benefits, including job boards, conferences, career services, and professional development opportunities. Professional organizations also help direct the field's overall vision, advocating for policy changes, diversity, and ethical standards in order to help mold the future of data science. The DSA is a non-profit association of professional data scientists that strives to promote the field of data science while also addressing issues of ethics, diversity, and fairness. Members enjoy benefits such as job boards, educational courses, and international conferences. The ASA is the world's largest community of statisticians, advocating for excellence in the field. They offer publications, meetings, and educational courses. Members can take advantage of career services, discounts, access to journals, and professional development opportunities. The DAA builds community among digital data analysts in order to advance and promote public understanding of how data can benefit the digital world. Members participate in events, educational opportunities, advocacy, and research. Those interested in earning their data science master's online can take advantage of a variety of financial aid resources. Some online data science master's programs offer individual and merit-based scholarships. It's wise to check with your program of interest to see if any scholarships are available and contact your school's financial aid services to identify any additional resources and opportunities. It's also important to complete a FAFSA form to see if you qualify for federal funding opportunities, such as grants, loans, and scholarships.